"Cotisso" are blocks of colored glass made by Effetre factory in Murano/Venice, Italy. Cotisso are irregular, fascinating, and stunning chunks of raw glass. Cotisso is the basis for making millefiori glass, glass vases, glass lamps, etc. It is the basis for "Dalle de verre" mosaics. Melt and flatten and smalti is produced. This cotisso is 100% Italian glass coe 104. Perfect for mosaic artists wanting more 3D and texture in their art. Easily cut with a hammer and hardie. Thinner pieces can be cut with nippers. Cotisso Assorted Hot Colors - Back in stock! Cotisso Assorted Neutrals - Back in stock! Cotisso Assorted Reds - NEW! 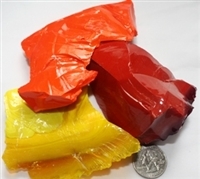 Assortment of Cotisso hot colors (Opaques-Cherry Red, Yellow, Orange). 100% Italian glass coe 104. Perfect for mosaic artists wanting more 3D and texture in their art. Easily cut with a hammer and hardie or a regular hammer. Thinner pieces can be cut with nippers. 1 pound assortment of Cotisso neutral colors (sand, grey, black, white). Picture shows a 1 pound quantity. 100% Italian glass coe 104. Perfect for mosaic artists wanting more 3D and texture in their art. Easily cut with a hammer and hardie. Thinner pieces can be cut with nippers. 1 pound assortment of Cotisso red colors (transp rose-amber, opaque red, transp red, and pink-white). Picture shows about a 1 pound quantity. 100% Italian glass coe 104. Perfect for mosaic artists wanting more 3D and texture in their art. Easily cut with a hammer and hardie. Thinner pieces can be cut with nippers. 1 pound assortment of Cotisso green colors(transp emerald, opaque light green, transp aquamarine, opaque aqua-malachite, lime). Picture shows a little over a 1 pound quantity. 100% Italian glass coe 104. Perfect for mosaic artists wanting more 3D and texture in their art. Easily cut with a hammer and hardie. Thinner pieces can be cut with nippers. 1 pound assortment of Cotisso blue colors(transp blue, transp light blue, opaque periwinkle, and opaque turquoise). Picture shows a 1 pound quantity. 100% Italian glass coe 104. Perfect for mosaic artists wanting more 3D and texture in their art. Easily cut with a hammer and hardie. Thinner pieces can be cut with nippers. Crystal clear chunks of fine cotisso glass. 100% Italian glass coe 104. Perfect for mosaic artists wanting more 3D and texture in their art. Easily cut with a hammer and hardie. Thinner pieces can be cut with nippers. 12 oz shown in picture. Opaque black chunks of fine cotisso glass. 100% Italian glass coe 104. Perfect for mosaic artists wanting more 3D and texture in their art. Easily cut with a hammer and hardie. Thinner pieces can be cut with nippers. 8 oz shown in picture. Solid color black, picture shows other tones from lighting. Opaque white chunks of fine cotisso glass. 100% Italian glass coe 104. Perfect for mosaic artists wanting more 3D and texture in their art. Easily cut with a hammer and hardie. Thinner pieces can be cut with nippers. 8 oz shown in picture. Opaque sand color chunks of fine cotisso glass. 100% Italian glass coe 104. Perfect for mosaic artists wanting more 3D and texture in their art. Easily cut with a hammer and hardie. Thinner pieces can be cut with nippers. 6 oz shown in picture. Opaque grey color chunks of fine cotisso glass. 100% Italian glass coe 104. Perfect for mosaic artists wanting more 3D and texture in their art. Easily cut with a hammer and hardie. Thinner pieces can be cut with nippers. 10 oz shown in picture. Transparent brown color chunks of fine cotisso glass. Looks like root beer. 100% Italian glass coe 104. Perfect for mosaic artists wanting more 3D and texture in their art. Easily cut with a hammer and hardie. Thinner pieces can be cut with nippers. 5 oz shown in picture. Opaque brown color chunks of fine cotisso glass, looks like chunks of chocolate! 100% Italian glass coe 104. Perfect for mosaic artists wanting more 3D and texture in their art. Easily cut with a hammer and hardie. Thinner pieces can be cut with nippers. 5 oz shown in picture. Cotisso Transparent Red Cotisso Opaque Mauve Swirl Cotisso Transparent Rose-Amber NEW! Transparent red color chunks of fine cotisso glass. 100% Italian glass coe 104. Perfect for mosaic artists wanting more 3D and texture in their art. Easily cut with a hammer and hardie. Thinner pieces can be cut with nippers. 11 oz shown in picture. Opaque mauve with swirling colors chunks of fine cotisso glass. 100% Italian glass coe 104. Perfect for mosaic artists wanting more 3D and texture in their art. Easily cut with a hammer and hardie. Thinner pieces can be cut with nippers. 11 oz shown in picture. Cotisso Opaque Pink-White NEW! Cotisso Opaque Cherry Red - Back in stock! Cotisso Opaque Orange - Back in stock! Opaque cherry red color chunks of fine cotisso glass. 100% Italian glass coe 104. Perfect for mosaic artists wanting more 3D and texture in their art. Easily cut with a hammer and hardie. Thinner pieces can be cut with nippers. 1 pound shown in picture. Opaque bright orange color chunks of fine cotisso glass. 100% Italian glass coe 104. Perfect for mosaic artists wanting more 3D and texture in their art. Easily cut with a hammer and hardie. Thinner pieces can be cut with nippers. 11 oz shown in picture. Cotisso Opaque Yellow Cotisso Transparent Yellow Cotisso Opaque Dark Yellow NEW! Opaque solid yellow color chunks of fine cotisso glass. 100% Italian glass coe 104. Perfect for mosaic artists wanting more 3D and texture in their art. Easily cut with a hammer and hardie. Thinner pieces can be cut with nippers. 12 oz shown in picture. Transparent yellow color chunks of fine cotisso glass. 100% Italian glass coe 104. Perfect for mosaic artists wanting more 3D and texture in their art. Easily cut with a hammer and hardie. Thinner pieces can be cut with nippers. 12 oz shown in picture. Opaque solid dark yellow color chunks of fine cotisso glass. A few shades darker than the regular opaque yellow. 100% Italian glass coe 104. Perfect for mosaic artists wanting more 3D and texture in their art. Easily cut with a hammer and hardie. Thinner pieces can be cut with nippers. 12 oz shown in picture. Opaque solid lime color of fine cotisso glass. 100% Italian glass coe 104. Perfect for mosaic artists wanting more 3D and texture in their art. Easily cut with a hammer and hardie. Thinner pieces can be cut with nippers. 6 oz shown in picture. Opaque solid light green color of fine cotisso glass. 100% Italian glass coe 104. Perfect for mosaic artists wanting more 3D and texture in their art. Easily cut with a hammer and hardie. Thinner pieces can be cut with nippers. 7 oz shown in picture. Transparent emerald solid green color of fine cotisso glass. 100% Italian glass coe 104. Perfect for mosaic artists wanting more 3D and texture in their art. Easily cut with a hammer and hardie. Thinner pieces can be cut with nippers. 5 oz shown in picture. Transparent aquamarine color of fine cotisso glass. 100% Italian glass coe 104. Perfect for mosaic artists wanting more 3D and texture in their art. Easily cut with a hammer and hardie. Thinner pieces can be cut with nippers. 5 oz shown in picture. Transparent light blue color of fine cotisso glass. 100% Italian glass coe 104. Perfect for mosaic artists wanting more 3D and texture in their art. Easily cut with a hammer and hardie. Thinner pieces can be cut with nippers. 8 oz shown in picture. Transparent blue color of fine cotisso glass. Not as deep a blue as the cobalt. 100% Italian glass coe 104. Perfect for mosaic artists wanting more 3D and texture in their art. Easily cut with a hammer and hardie. Thinner pieces can be cut with nippers. 9 oz shown in picture. Opaque solid color periwinkle color of fine cotisso glass. 100% Italian glass coe 104. Perfect for mosaic artists wanting more 3D and texture in their art. Easily cut with a hammer and hardie. Thinner pieces can be cut with nippers. 7 oz shown in picture. Opaque turquoise blue color of fine cotisso glass. 100% Italian glass coe 104. Perfect for mosaic artists wanting more 3D and texture in their art. Easily cut with a hammer and hardie. Thinner pieces can be cut with nippers. 9 oz shown in picture. Transparent amethyst color fine cotisso glass. 100% Italian glass coe 104. Perfect for mosaic artists wanting more 3D and texture in their art. Easily cut with a hammer and hardie. Thinner pieces can be cut with nippers. 8 oz shown in picture. Solid opaque purple color fine cotisso glass. 100% Italian glass coe 104. Perfect for mosaic artists wanting more 3D and texture in their art. Easily cut with a hammer and hardie. Thinner pieces can be cut with nippers. 8 oz shown in picture.